A HILARIOUS TAKE ON JUST ABOUT EVERY-THING ASSOCIATED WITH AIR TRAVEL. This book provides invaluable perspectives on some of the most common situations encountered by fliers. Rest assured, your flying experience will never be the same again. A must read as you prepare for, or take your next flight! 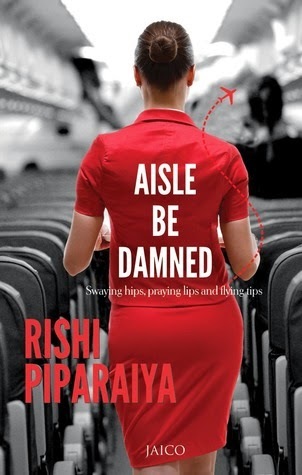 RISHI PIPARAIYA is an over-worked and overtravelled corporate executive based in the skies, 38,000 feet over India. Firstly, I'd like to apologize for posting this very, very, very late book review. While the main reason this review got delayed was because of a family emergency - there is no excuse for not remembering to put up a review for this wonderfully witty book about air travel. The subtitle of the book reads, "Swaying hips, praying lips and flying tips". I don't think I read the summary of the book well enough before hitting the "apply for review" button on Tales Penseive's website. In my head, I had already dreamed up that this book was probably going to be about some dude who has to take an agonizing long trip in some distant place and he's going to talk us all through that long, hard and tiresome journey. Not being a huge fan of boarding flights myself (the landing has always scared me - don't ask why! ), I found myself getting deeply immersed in this well-written book which deals with all the troubles one face right from the ground staff to the time they're on the flight....and until the time they have reached their destination and are trying their best to get to the specific places they are meant to be in. This book clearly tells you what you should expect from the airport to the flight, and how you can handle many of the situations which clearly require thinking on your feet. I loved the way Piparaiya narrates all the incidents...especially the one about him being sloshed out of his mind and convinced completely there was another Rishi Piparaiya who was being paged continuously to board his flight. While Piparaiya has been criticized for making light a lot of the true horrors of flying, it was this humor that I appreciated. Having been on a plane where the passengers were convinced they were going to die, I know fear spreads faster than any other epidemic. The only way to curb that is through laughter! And our author does exactly that. Pick up this book if you too are disgusted at the very thought of having to board flights every other day of your life. You'd begin to enjoy your tiresome journeys. And in case you are worried about boarding that first flight, go right ahead - this book is exactly what you need to give you a push in that direction. Overall, this was a very entertaining read. I personally look forward to more such books.